What is a flight zone of an animal? Flight zone is an area surrounding an animal, a distance an animal will keep for feeling safe from predators or potential danger. If encountered in this zone, including the herd handler, the animal might become alarmed, or try to escape or show escape behaviors. 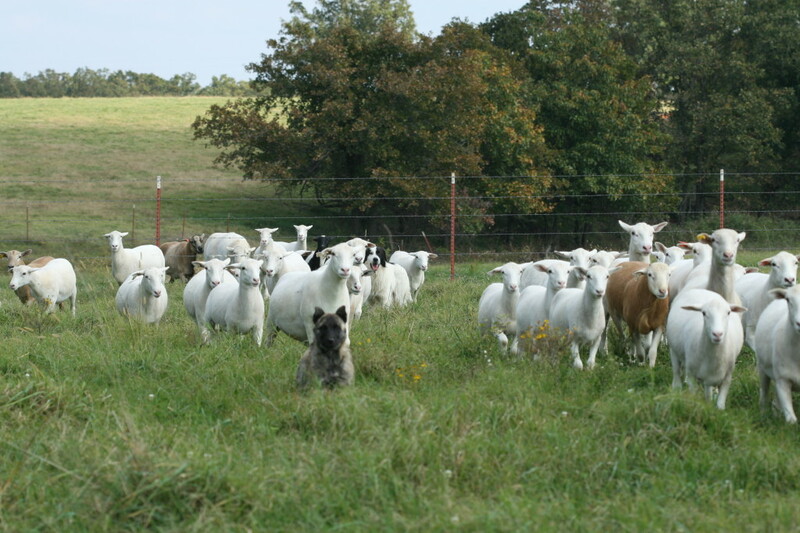 It is often difficult to move large groups of herding animals, especially if they are not completely tamed. Once they are completely tamed, they will not have a flight zone. For low stress handling of the herd animals such as cattle, sheep, pigs, etc. 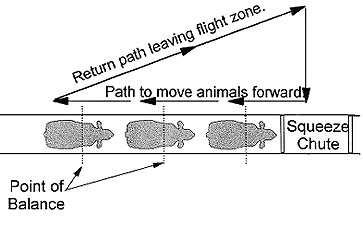 it is important to understand the flight zone of the animals. Animals tend to move in a circle, keeping a safe distance from the handler. One of the important thing to remember is that they tend to move in the opposite direction from the herd handler, and therefore, by moving in the opposite direction from the desired direction can move the animals in the desired direction. Walking in the opposite direction also tend to speed up the movement of the herd. To handle the livestock with low stress efficiently, a handler must learn the animal behaviors with respect to the point of balance. It is important for the handler to stay behind the point of balance form each animal in order to make them move forward. 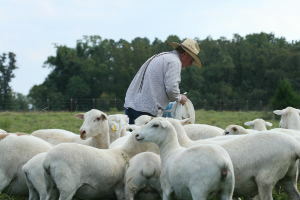 The point of balances is located behind the shoulders of each animal, depending on their angle of vision, and so in order to move the livestock forward; a handler must stand behind the point of balance. 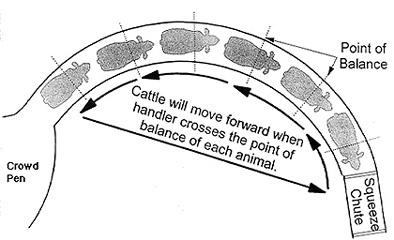 If the handler moves forward and goes in front of the point of balance, the animals will move back. Most of the herding animals tend to move in circles. Many animal handlers make a mistake of trying to move the animals by standing in front of the point of balance. However, animal handlers will find it useful to learn the flight zone diagram and point of balance for making the animals move in a chute. Moving herd animals in a chute is much easier if the handler move behind the point of balance. Once the animal starts moving, there will be no need to prod every animal. Animal handlers who understand the importance of flight zone and point of balance will find it a lot easier to move the animals through chute. Once they keep going in a chute, they should be allowed to move without prodding. Most wild animals like to keep the flight zone as their comfort zone or personal space, especially if they are not properly tamed. Once the animals are completely tamed, they will have no flight zone, and people can go as close as they want without alarming the animals. If the animals are not tamed, they will try to escape if the handler enters the flight zone. Once the animals are tamed, they should be led towards the desired direction calmly instead of driving them. This is the most stress free way of moving cattle across a pasture. This principle will work on any farm animal on feedlots, ranches, stockyards and similar places. The point of balance may also depend on whether the animals are grazing in an open pasture or a confined place. In open areas, it is important to follow the wide angle view of the animals. An animal tend to move forward once the handler moves past the view of the animal. 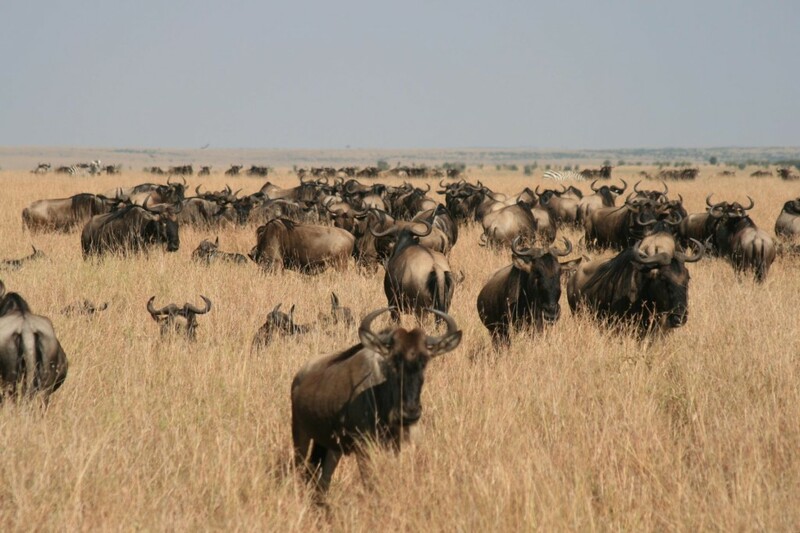 It also needs practice for moving the entire herd in large groups and staying in the point of balance of each animal. 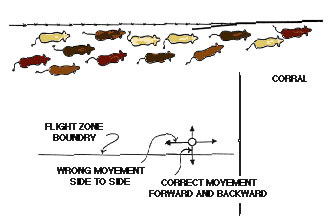 For keeping all animals moving in the same direction in large groups, it is important to stay away from the flight zone of all animals and to stay behind the point of balance. 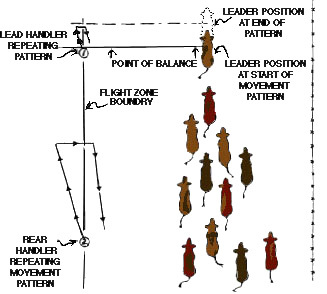 A handler can move the animals smoothly by repeating movement patterns. Using these techniques would make it easier to move any size herd of animals or livestock, such as cattle, pigs, sheep, and so on in and out of the pen, into the grazing area while keeping them under control it requires practice to perfect these techniques and can make animal handling really easy and stress free. Low stressed stock are known to ‘feed and breed’ better, recognising our relationship with an animals/herd/flock/mob’s flight zone has them far less stressed. This can translate in an economic cense for any meat producer. In my own experience, respecting the ‘live stocks perspective’ can make handling safer and more enjoyable for us humans. I certainly feel better knowing the stock I work and the stock I own, experience something less than ‘one bad day’. Some jurisdictions propose that low stress handling is ‘best practice’, advise, ask meat producers to adopt an approach that recognises the ‘flight zone’. A point I can recognise with due regard to food ethics, and hey I eat meat! any time invested, de stressing live stock, conditioning them to ‘flight zone conscious handling’ returns in multiples, with no more: bolting stock, damage to infrastructure, bruising of carcase, extra hands needed, domestic turbulence (yes my beautiful bride is townie, city folk), etc.